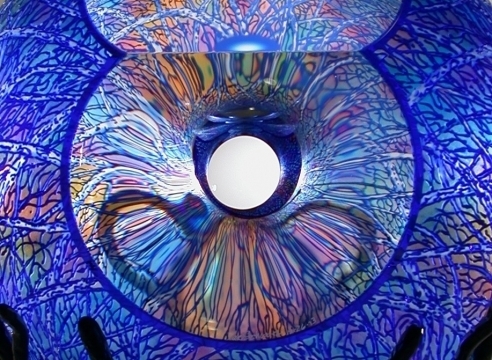 Washington glass artist David Schwarz is fascinated with the use of optics and perspective. The blown and cut glass orbs he creates reflect and refract mysterious and beautiful shapes and colors. His illusionary play with line, color and form lets us into a private and intimate kaleidoscopic space. Scientific and organic in their essence, these jewel-like, weighty shapes mesmerize and seduce in their presence. Born in Vancouver, WA in 1952, David Schwarz received a Masters in Science/Glass from Illinois State University in the early 1980s. From 1979 to 1986, he taught at the Pilchuck Glass School while developing his distinctive style. Since that time, Schwarz has been a full time artist working at his studio in Ridgefield, WA. His work is included in such collections as Corning Museum of Glass, NY; Milwaukee Museum of Art, WI; Smithsonian Museum of American Art, Washington DC; the High Museum, Atlanta, GA; and the Hunter Museum of Art, Chattanooga, TN. He has shown his sculpture in solo exhibitions both nationally and internationally since 1980. In 2008, Schwarz was featured on Oregon Public Broadcasting’s Oregon Art Beat.